We not only examine patients and diagnose their condition, we also carry out surgical treatment and supervise post-operative and follow-up care - a medical all-round package. 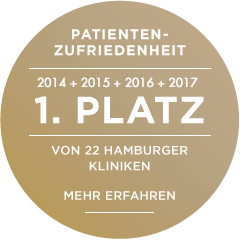 Another outstanding feature of the ORTHOCLINIC HAMBURG is our close co-operation between practice and clinic: With two locations in Hamburg we are at your service as your competent partner at all times. Our practice is located in Schnelsen. We perform operations in the Fleetinsel Clinic – for both in- and outpatient treatment.